The BriteTap automatic chicken waterer provides sparkling clean water for your whole flock. 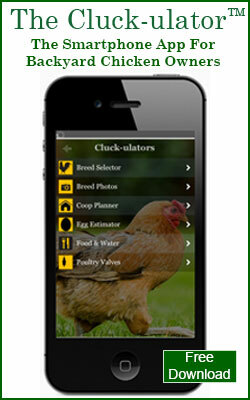 Owners can begin using the BriteTap immediately with newborn chicks. Check out the video below to see the BriteTap waterer in action. The BriteTap waterer is a great solution for your brooder because it keeps your baby chick's home nice and clean -- No pans of poop-filled water to spill out into the brooder. No pans of poop-filled water for you to touch or clean. Your chick gets fresh clean water every time it drinks. Getting your baby chicks to use the BriteTap poultry waterer is incredibly easy because a chicken's natural behavior is to peck at brightly colored objects. The red valves on the bottom of the BriteTap waterer make a great target. Once one baby chick learns to drink, everyone else learns as well. Most owners don't need to do anything to get baby chicks to use the waterer. 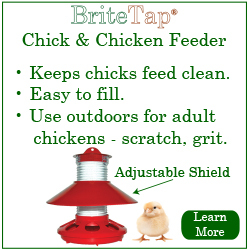 If your chicks were purchased from a hatchery or local feed store where they were using a traditional pan style waterer, we recommend showing the chicks the BriteTap before releasing them into the brooder. Just tap the baby birds beak against the stem of the valve so show them that it produces water. Then let them go and wait for them to start pecking at the red valves. That's all there is to it. The BriteTap water is a patent pending poultry fountain that makes it easy for backyard chicken owners to give their birds clean water. 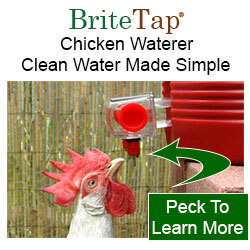 BriteTap(TM) is a registered trademark of ChickenWaterer.com.